Sales volume. Overall, down 10.47%. 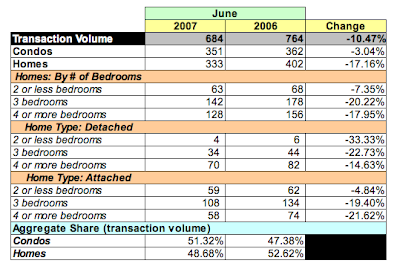 YoY, condo sales volume was down 3.04% and home sales volume dropped 17.16%. All categories of single family homes saw a decline in sales volume: -7.35% for 2 bedroom homes; -20.22% for 3 bedroom homes; and -17.95% for 4+ bedroom homes. Dollar volume. In aggregate, down a whopping 16.59%. 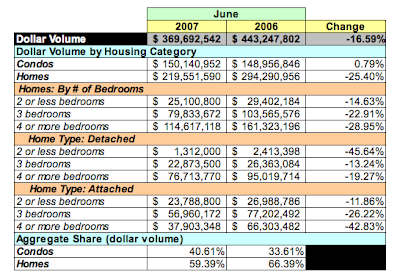 Dollar volume for condos was catatonic (+0.79%), homes fell off a cliff (-25.4%). Lower dollar volume for all home sizes: -14.63% for 2 bedroom homes; -22.91% for 3 bedroom homes; and -28.95% for 4+ bedroom homes. Average sales price. Again, down: 6.84%. Average prices for condos surged 3.95% to $427,752, while homes nosedived 9.94% YoY to $659,314 [am I too melodramatic?]. Days on market. Yes, on average the DOM grew to 63 days, but a closer look shows that more than 2/3 of all homes [70.5%] sold within 60 days. Inventory. Based on June's transaction rates and active listings, there is a 4.9 month's supply of condos, an increase of 12.64% over May, while home inventories fell 1.05% to 4.79 months. 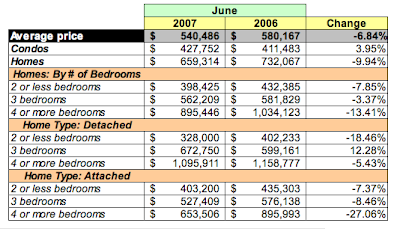 June's numbers nail the Spring selling season, aka 2Q2007; it's a disaster [I'll post the 2Q numbers in a future post]. 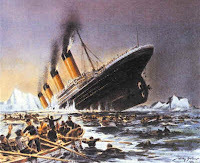 If April's data was uninspiring and May's drove seasoned real estate agents to the nearest bar capable of mixing a stiff dry martini [three olives, please], June would make a seasoned broker cry. The only bright spot in the market was that condos were marginally higher on dollar volume and average price and three bedroom detached homes had a 12.28% increase in average price. Great post! Thank you for doing this. I and every person who lives there loves the building and location. Naysayers can't afford to live there and are sour grapes.Location,location,location-I have Metro,Giant,Borders,Bus,any restaurants I want and Bloomingdales,Cartier etc. What else is there? Every amenity including gym and party room,underground parking.